As a homeowner you have a choice between two kinds of locks for your doors. You can buy ordinary locks from a serve-youself hardware store or high-security lock from Pre-Lock Security. We are a professional Toronto locksmith service provider that will insure your home has unparalleled levels of security that truly is only available when you install Mul-T-Lock High Security products. Serve-your self hardware stores locks have keys that can be copied easily. 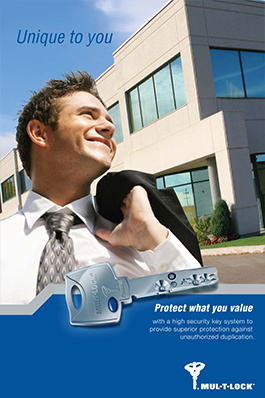 High security locks provide superior protection against unauthorized key duplication. Mul-T-Lock key technology is superior to ordinary sawtooth keys that prevent keys from being copied by just about anyone. Did you know there are tens of thousands of places where you can get a key duplicated in Toronto? How many locksmith shops, hardware stores, malls, and shipping/mailbox stores do you have in your area alone? They all have key duplicators. 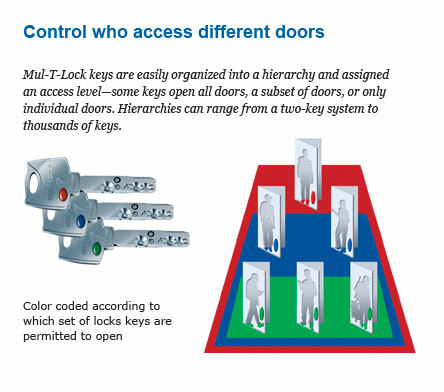 Without a key control system, you cannot be sure who has keys or how many keys have been made for your locks. 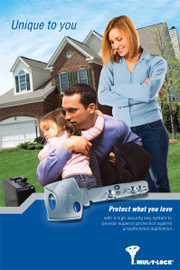 The Mul-T-Lock patented key system offers total key control. The Mul-T-Lock ID Card is given to you with your initial order. Your personal information will be securely kept on file, and keys can be requested in the future only by you and with your Mul-T-Lock ID Card. Give yourself peace of mind knowing there aren't any unauthorized keys floating around. Install Mul-T-Lock Today!!! In addition to most major credit cards, we accept purchase orders from. Fortune 100 corporations, educational institutions, and government agencies located in Ontario. All purchase order terms are Net 30 days. The Pre-Lock® Name & Pre-Lock® Logo & Better Lock Next Time® & Pre-Alarm® are Registered Trade Marks of Pre-Lock Security Services Inc.